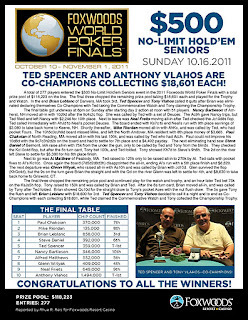 We had a total of 101 players in the $400 7-Card Stud Eight-or-Better event at the Foxwoods World Poker Finals. Joseph Lee Wins the $400 Deep Stack Event! Joseph Lee is the champion of the $400 Deep Stack No-Limit Hold 'em Event! 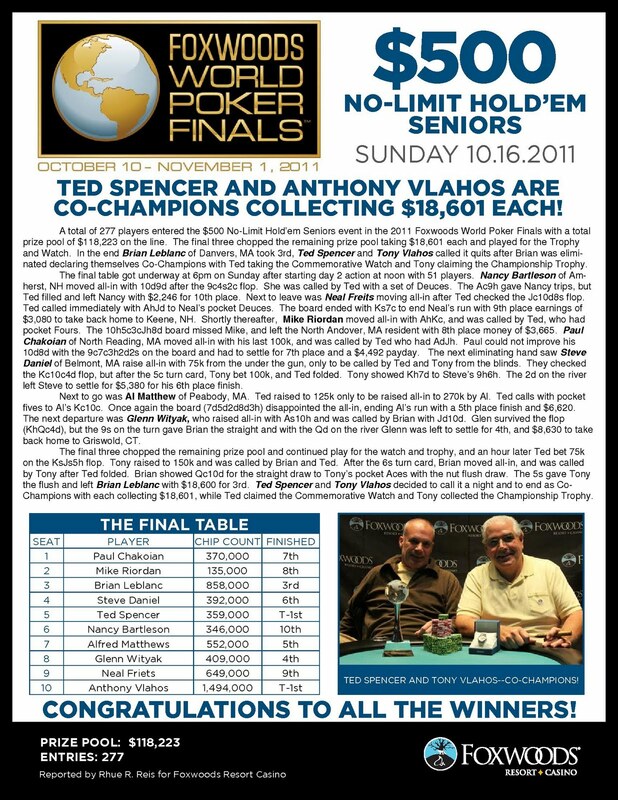 He takes home $28,259, the World Poker Finals Trophy and the watch! 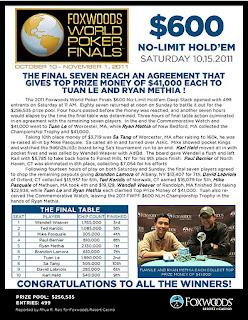 The board runs out [Ts][5c][4d][Ah][4c] and Lee pairs his ace to win the pot and eliminate McCarthy in 2nd place for $16,351. The board runs out [Qs][9h][5d][Ks][9c] and McCarthy's pocket deuces hold up to win the pot and eliminate Koerber in 3rd place for $10,427. Ferris has Lee dominated until the board runs out [Ac][Jd][4c][7d][Kh]. Lee pairs his four to take the pot and eliminate Ferris in 4th place for $8,353. Shpur has McCarthy dominated until the board runs out [Js][Tc][8s][Jc][4h]. McCarthy makes trip jacks to win the pot and eliminate Shpur in 5th place for $6,517. The board comes [Kd][7h][6h][7c][Ad] and Shpur's queen high holds up to eliminate Agrahavapu in 6th place for $5,272. The board comes [Kd][7h][3h][Tc][Kh] and Ferris's jacks hold up to eliminate Kellish in 7th place for $4,384. The board comes [Qd][7c][6s][5s][4d] and Lee's pocket eight hold up to win the pot and eliminate Marchese in 8th place for $3,555. 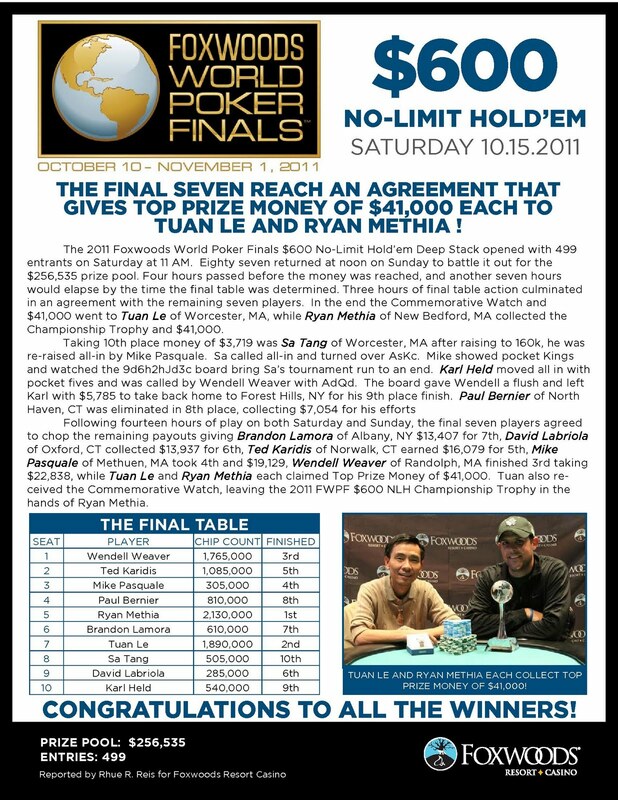 The board runs out [Qs][2d][2s][8d][Tc] and Shpur wins the pot to eliminate Jandreau in 9th place for $2,913. The board runs out [Kc][6d][4c][Jd][Ac] and McCarthy wins the pot to eliminate Araujo in 10th place for $2,014. We have reached the final table of 10 in the $400 Deep Stack event. 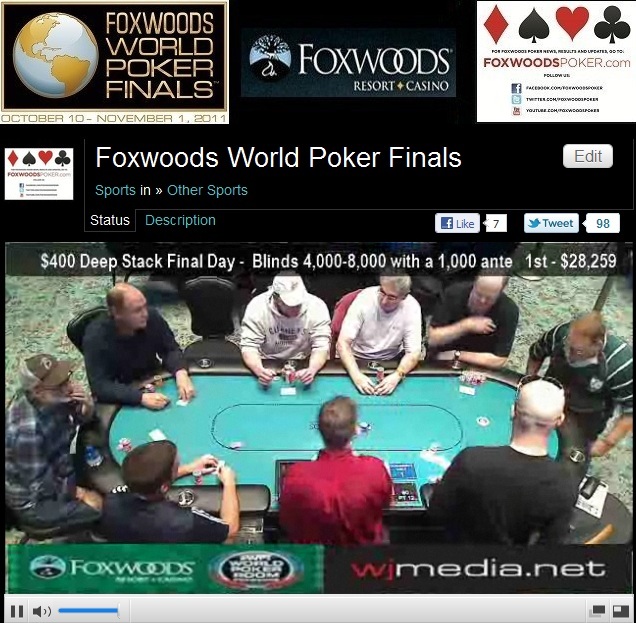 We had a total of 431 players in the $300 NLHE Deep Stack Bounty event at the Foxwoods World Poker Finals. The final day of the $400 Deep Stack event is now streaming live. To watch the action, just click "Watch LIVE Video" at the top of the page. The $300 No-Limit Hold 'em Deep Stack Bounty event is now underway. For each player you eliminate, you take home a $50 bounty. After playing nearly the entire final level of the day on the bubble, we had a double elimination as time ran out in Level 18. The remaining 34 players are all in the money and are now bagging up their chips. Play will resume at noon tomorrow as the 34 players play down to a champion. Ronnie Pease is the end of Day 1 chip leader with 670,500.